In early February 2011, we experienced the IPocalypse (defined as the exhaustion of global IPv4 address pool) and the IPv6 awareness has entered mainstream media, resulting in vast amounts of misinformation. The downside of this public awareness is obvious: the C-level officers in your organization will start asking IPv6-related questions and you better have the answers ready. Where will my organization first meet IPv6? What are the immediate steps I have to undertake to be prepared? This section highlights the important differences between IPv4 and IPv6, including neighbor discovery mechanisms (ARP versus ICMPv6 ND/ICMPv6 RA) and autoconfiguration (DHCP versus SLAAC/DHCPv6/ICMPv6 RA combination). It also explains the IPv6 addressing guidelines as they apply to the enterprise networks. In this part of the webinar, you’ll learn more about NAT444 (also called Carrier Grade NAT or Large Scale NAT), DS-Lite, 6rd and NAT64 (address translation from IPv6 to IPv4). You’ll also discover why it’s important to deploy IPv6 at the edge of your enterprise network. 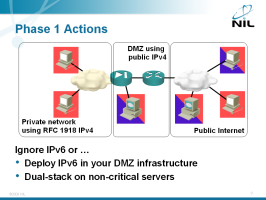 Assuming you’re persuaded it’s time to deploy IPv6 at the edge of your network, this section will give you down-to-earth tips and steps you can follow to deploy an IPv6 pilot in your DMZ. You’ll also find out how you can make legacy applications reachable over IPv6 by deploying NAT64 or IPv6-to-IPv4 load balancing. There are numerous other IPv6 issues you should consider, ranging from VPN access and IPv6 multihoming to network management and security. This section touches most of them and gives you clear guidelines that will help you streamline your IPv6 deployment. If you are designing or deploying IP-based enterprise networks connected to the global Internet, you simply have to attend this webinar. To attend this webinar, you should be familiar with IP, IP routing and Internet-related protocols (DNS and HTTP). The session was very well run. It started on time, was well organized, and the VoIP worked well. Ivan attentively answered each attendees questions, and is clearly very knowledgeable in the subject matter. 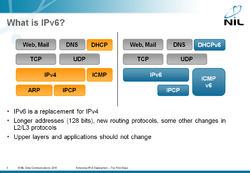 A well done broad overview of the IPv6 landscape. The information on NAT64 helped me finally get how it is used for making IPv4 services available to IPv6 clients. Ivan's slides, as well as his spoken presentation, are always well organized, thorough, and fully informed. Thanks Ivan - you are in a class by yourself. RT @bobmccouch Watching the @ioshints IPv6 Enterprise Deployment webinar! < Ivan's webinars are full of #WIN! Ivan Pepelnjak (CCIE#1354 Emeritus) has been designing, deploying, operating and troubleshooting IP-based enterprise and service provider networks since 1990. 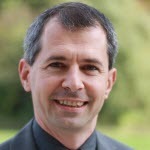 He’s the author of EIGRP and MPLS books published by Cisco Press, numerous articles and highly praised webinars, including Building Large IPv6 Service Provider Networks, IPv6 Security and IPv6 Transition Mechanisms. His blog, where you'll find numerous data center- and IPv6-related articles, is usually considered one of the best technology-focused internetworking blogs.